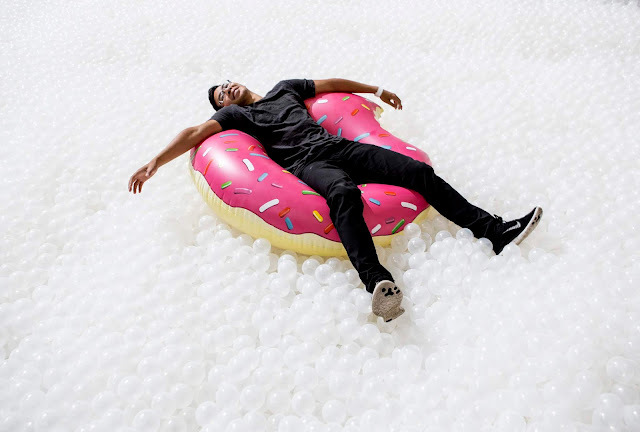 Navy Pier, Chicago’s top-attended lakefront destination, invites guests to beat the winter blues by hitting The Beach Chicago – a free, interactive public art installation on display in the historic Aon Grand Ballroom from Saturday, January 19 through Sunday, February 3. Presented in partnership with EXPO CHICAGO (The International Exposition of Contemporary and Modern Art) and created by Snarkitecture, a New York-based collaborative design practice, The Beach Chicago is a large-scale installation set to transform the Pier’s iconic 18,000-square-foot space into an indoor beach, complete with lounge deck chairs, lifeguard chairs, umbrellas, inflatables and signage that mimic the sensation of a day at the beach. The installation consists of one million antimicrobial and recyclable plastic spheres enclosed in a large, open space. 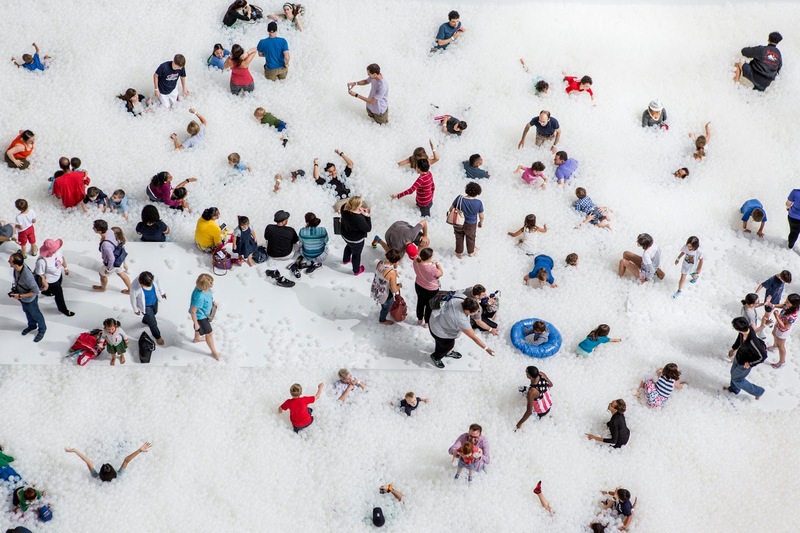 Guests of all ages are welcome to ‘swim’ through the sea of translucent white spheres as part of the artistic experience or simply gaze and revel in the installation from the pier and other viewing areas throughout the installation. The Beach Chicago promotes familiar social cues and visual sensations of a beach within the unique setting of the Aon Grand Ballroom, a historic landmark designed by architect Charles Sumner Frost and constructed in 1916 as part of Navy Pier’s original structure. Earlier iterations of The Beach have taken place in Washington, D.C.; Tampa, Florida; Sydney, Australia; Paris, France; and Bangkok, Thailand. Chicago will serve as the third site in the U.S. and first in the Midwest. Navy Pier guests are encouraged to make the most of their “day at The Beach” by exploring the many new dining, retail and leisure options available across the recently renovated Pier. Select restaurants – including Bubba Gump Shrimp Co., Giordano’s, Harry Caray’s Tavern, Jimmy Buffett’s Margaritaville, Riva Crab House, Tiny Tavern and more – will have beach-themed menus and cocktails, among other special offers to complement the experience. Click here to view the full listing of Pier-wide beach-inspired promotions available throughout the duration of the exhibit. In addition, Chicago Shakespeare Theater will continue to present its production of A Midsummer Night’s Dream, offering another enchanting escape this winter. Guests can complete their ‘beach day’ with a ride on Chicago’s iconic Ferris wheel. Enclosed and heated, the year-round Centennial Wheel pairs perfectly with The Beach Chicago, providing 360 views of the city’s famous beaches from 200 feet above water. In advance of the unveiling of The Beach Chicago, the Graham Foundation – in partnership with EXPO CHICAGO and Navy Pier – will present a talk by Snarkitecture’s Alex Mustonen and Benjamin Porto, the creative minds behind The Beach. The free, public talk will be held on Thursday, January 17 at 6 p.m. at the Graham Foundation, located at 4 West Burton Place. Following this event, the Graham Foundation Bookshop will host a book signing of Snarkitecture’s recent catalogue, published by Phaidon. Hosting The Beach Chicago is one of the many ways Navy Pier continues to honor its commitment to offer free, year-round arts and cultural programming, designed to inspire, educate and connect communities across the city and globe. For more information, visit www.navypier.org or download the Navy Pier app on any Android or iOS device. Snarkitecture is a New York-based collaborative design practice established to investigate the boundaries between disciplines. The name is drawn from Lewis Carroll’s The Hunting of The Snark, a poem describing the “impossible voyage of an improbable crew to find an inconceivable creature.” In its search for the unknown, Snarkitecture creates work that includes large-scale projects, installations and objects. Snarkitecture’s work focuses on the reinterpretation of everyday materials, structures and programs to new and imaginative effect. With a conceptual approach centered on the importance of experience, the studio creates unexpected and memorable moments that invite people to explore and engage with their surroundings. For more information, visit www.snarkitecture.com. EXPO CHICAGO, The International Exposition of Contemporary and Modern Art, is presented by Art Expositions, LLC at Navy Pier’s Festival Hall, hosting more than 135 leading International exhibitors presented alongside one of the highest quality platforms for global contemporary art and culture. Entering its eighth year as a leading international art fair, EXPO CHICAGO offers diverse programming including /Dialogues, IN/SITU, IN/SITU Outside, EXPO VIDEO, the Curatorial Forum, the Art Critics Forum, Special Exhibitions, EXPO Sound and OVERRIDE | A Billboard Project. In addition, EXPO CHICAGO continues to publish THE SEEN, Chicago's International Journal of Contemporary & Modern Art. Under the leadership of President and Director Tony Karman, EXPO CHICAGO draws upon the city’s rich history as a vibrant international cultural destination, while highlighting the region’s contemporary arts community and inspiring its collector base. EXPO CHICAGO’s eighth edition will take place September 19 – 22, 2019, in alignment with the 2019 Chicago Architecture Biennial (September 19, 2018 – January 5, 2020). For more information on EXPO CHICAGO and EXPO ART WEEK (September 16 – 22, 2019) visit expochicago.com. The Beach Chicago is supported by The Chicago Free For All Fund at The Chicago Community Trust, the Navy Pier Associate Board and Hilton Worldwide. Located on Lake Michigan, Navy Pier is one of the top-attended nonprofit destinations in the Midwest, stretching more than six city blocks and welcoming more than 9 million guests annually. Originally opened in 1916 as a shipping and recreation facility, this Chicago landmark showcases more than 50 acres of parks, restaurants, attractions, retail shops, sightseeing and dining cruise boats, exposition facilities and more. The Pier recently celebrated its 100th anniversary with the unveiling of the iconic Centennial Wheel, Polk Bros Park, Fifth Third Bank Family Pavilion and Peoples Energy Welcome Pavilion. In 2019, Navy Pier continues to usher in its second century with ongoing pier-wide redevelopment efforts – including a 220-room Hilton hotel with rooftop bar, a marina and more – in addition to free, year-round arts and cultural programming designed to inspire, educate and connect communities across the city and globe. For more information, visit www.navypier.org or download the free Navy Pier app for Android and iOS devices.